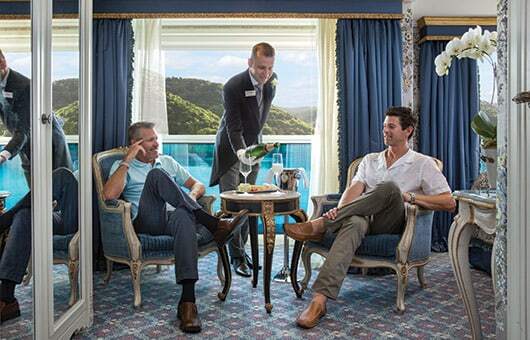 Uniworld's suites and staterooms provide an elegant and serene onboard sanctuary throughout your journey. From beds hand-crafted by Savoir® of England—purveyor to Europe’s finest hotels—to the highest quality linens and Italian marble-lined bathrooms, every element is designed with your ultimate comfort in mind. Uniworld ships feature stylish restaurants where guests can linger over a fine multi-course meal, an expansive Sun Deck, and plush lounges with full-service bars—the ideal spot for drinks with friends, after-dinner entertainment, or dancing the night away. We also offer a well-equipped fitness center and Serenity River Spa™ on every ship in Europe, perfect for an invigorating workout or a relaxing massage. *Special rates do not include port charges of $170 per person. Seminars are only available with the purchase of the cruise package from Investors Travel and will not be sold separately. Itinerary and excursions mentioned in this brochure are subject to change. All prices listed in US dollars. To protect your travel investment, please click here.